Antep Ezmesi: what can we say? We’re fully aware that we’re always saying different Turkish dishes are favourites for us…but then another food always springs to mind…and that’s a favourite, too. But Antep Ezmesi is one of the originals. An old faithful that’s always been on our meze table and, because we loved it so much when we tasted it, an Antep Ezmesi recipe was one of the first Turkish recipes we learned. We’re sure if you make spicy ezme at home – or if you’ve never tasted it yourself and you try it in a Turkish restaurant – you’ll love it, too…if you’re a fan of spicy food, that is. 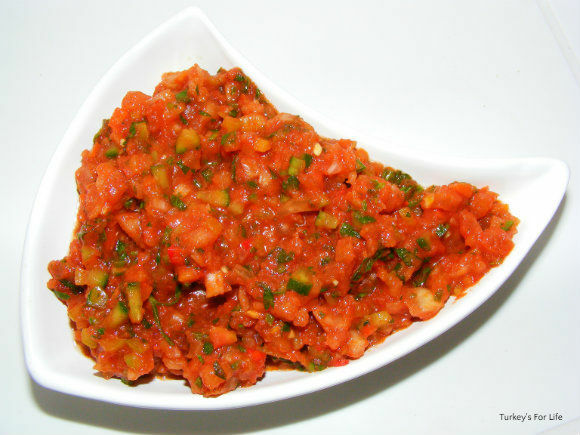 Antep ezmesi is spicy and zingy, yet crisp and refreshing, all at the same time. And when any friends come out to visit us in Fethiye and we go to the fish market or other restaurants around town, they’ll go to the meze fridges and their first choice of meze is always Antep ezmesi. No discussion between any of us. It’s only afterwards that we discuss further choices. Everyone loves Antep ezmesi. ‘Ezme’ is a Turkish word that means ‘crushed’. You’ll also see the word used to describe any other Turkish food that involves a bit of crushing, smashing up or grinding. Antep Ezmesi is from the southeast of Turkey (Gaziantep) and is supposed to be spicy – like a lot of other Eastern Turkish dishes – and so it’s always going to appeal to us as spicy food addicts. It’s basically a spicy tomato salad dip and the nearest thing we can think of to describe it to you is a hot salsa dip made with the freshest of ingredients. 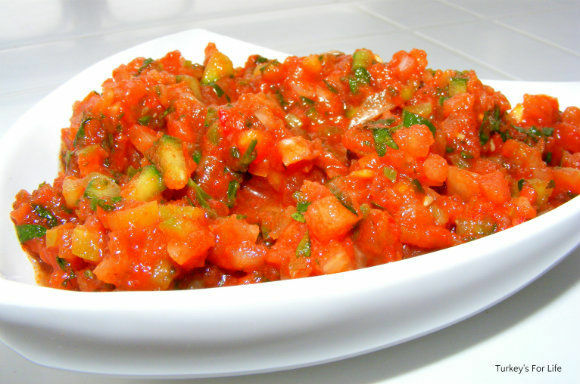 You’ll see spicy ezme in any Turkish restaurant or lokanta that serves mezeler (starters) from their fridges. It’s a staple – if there’s none there, it more than likely means it’s all been bought up. This, and the types of homemade ezme recipe you’ll find in Turkish cookery books, is much much better quality and far more tasty than the product you can buy from the supermarket deli counters in Fethiye. Antep Ezmesi bought from the deli counters is still tasty but it’s a completely different dish. For us, too much tomato puree is used rather than fresh, chopped tomato (no doubt because it’s much quicker to produce a large batch of it in this way) and you don’t get the same texture or the refreshing flavours on your tongue. It’s more of a paste than a salad and the taste is different, too. You can compare for yourself which you prefer. Now, we need to tell you this; if you make spicy ezme, we’d be misleading you if we said making your own Antep ezmesi recipe takes no effort. However, now we have told you that, we can also tell you the taste sensation afterwards is definitely worth your labours. If you’re desperate to make spicy ezme and you’re in a bit of a rush – or you just can’t be bothered to stand there chopping – you can use a food processor/mixer to chop most of your ingredients (except your tomatoes!!). Acılı Antep ezmesi is still amazingly good when you’ve used a food processor…but it’s just not quite as a good as when you decide to do some good old chopping by hand. Texture is the key difference here, and, if you use the food processor, be careful not whizz everything into a pulp. 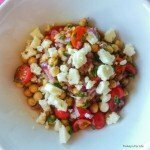 This Turkish ezme recipe uses light, healthy ingredients and the end result is a delicious spicy tomato salad. Place a pan of water on the hob and bring to the boil. Plunge your tomatoes into the water for just under 1 minute and then remove them and place in cold water. Now remove the skin from the tomatoes - it should peel away easily because of the boiling water. Cut your tomatoes in half, scoop out the seeds with a teaspoon and discard the seeds. Chop your tomatoes as finely as you can without them turning to pulp and add them to a large bowl. Now chop the onion, pepper, chillies and cucumber as finely as you can and add those to the tomatoes. Remove the stalks from your parsley and finely chop this before adding that to your other ingredients. Now add the mint, oil, vinegar, tomato puree and salt. Give everything a good mix and do a taste test. Add more chillies if necessary (Antep ezmesi is supposed to be spicy) and, if it seems too loose, add more salça (tomato puree), too. This Turkish ezme recipe is a base for you to follow and over time, you will add more of, or use less of certain ingredients depending on your taste. There is no cook time in this Antep Ezmesi recipe. The boiling water is merely an aid to peeling your tomatoes. All ingredients are raw. We have said our ezme recipe serves 6 people. Antep ezmesi is a meze that you can just put out on the table for people to help themselves so '6 people' is just a rough guide. And that’s it. You should now have before you a bowl of bright red loveliness, waiting to be eaten by your guests – because Antep ezmesi is great as part of a fabulous summer meze table, with fresh Turkish bread, or, as part of a main meal – it’s a great side to köfte. However you make your Turkish spicy ezme, it’s always guaranteed to impress your guests. For loads more meze inspiration, take a look at our full Turkish recipe index. Sounds great! Thanks for the recipe, I’ll give it a go sometime.. Right now our tomatoes are in great need of some sunshine so, when I can pick up a tomato that actually tastes like a tomato, I will make this again. I think that this dish really is a comfort food. Such simple ingredients transformed into an amazing dish to present to your friends. Sounds good – and there can’t be too many calories in it! I’ll be giving it a go! It is better with juicy red tomatoes – not rock hard pink ones. Hardly any calories at all Chris. The olive oil’s a bit naughty I suppose but it’s only a bit isn’t it! made the ezme which is really good, because i didn’t know how many chillis, i started with 2 fresh ones, because this was nowhere near enough, i then added pickled ones which worked a treat.Also i used a chopper for everything except the tomatoes, this made it really easy. Chopper is much easier, you’re right. The problem is, I dropped the lid to our mixer at Christmas and broke it so it’s back to chop chop chop till we get a new one! COK GUZEL…..I love “Antep Ezme”……my husband Dogan is from Izmir and when I go always order this with every dish. I can’t get enough of it. I’m going to try your recipe it looks very good. thanks for sharing. Ezme is always on our table as well when we go to restaurants. It’s the first one we choose and the others follow. I’d love to make this great recipe but i’m not an experienced cook, could you tell me how much is a ‘glug’ and what kind of vinegar should i use? I really don’t want to spoil such a great dish! hi have just returned from dalyan, and my hubby ate this every day!!!!!!!!!!!! he loves it. so i have just copied your recipe and he loves it!!!!!!!! thanks. what have i let myself in for . Hello sounds delicious. In Australia I dont see anything like this! Just wondering how Long this would last in the fridge? Thankyou for this recipe I love it and have made it many times now. I find it better to chop by hand. I have kept mine in the chiller part of the fridge and it has been fine after about 5 days. We are in Turkey at the moment in Dalyan and enjoying many different meze, but we always ask for this one. Thankyou again. Regards Ann.